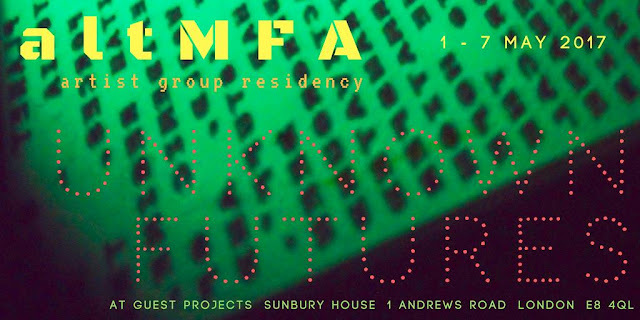 Simon Callery kindly hosted an evening for altMFA at his amazing studio in East London. He told us about his work and its development before opening up discussion and showing us his works in progress. Seeing the paintings in the environment in which they were made added to our understanding of their development, and the integrity with which Simon works. His passion for painting, his strong opinions, and seeing the works themselves made for a compelling evening. He explained how investigating archaeological practices has inspired his work. He considers every stage of a painting from supports, pigments, and binders to ways of orientating it to the wall. Many would consider them sculptures but Simon maintains that they are most definitely paintings. Many thanks to Simon for your hospitality and for missing the football for us!